We love a catch up with some of our favourite G&S Girls! This month we've spoken to 5 inspiring and super stylish women from different each of whom are supporting the ethical fashion movement in various different ways. Find out why shopping ethically is important to each of them and what their top picks are from G&S this season. Please introduce yourself, what do you do? Hello! Im Emily, a 24 year old Pisces who loves to travel. Im a London born Wellness Entrepreneur who’s determined to make a difference. I believe in incrementalism and work as the co-founder of POW Food, a wellness food business for the corporate world. Im also a conscious influencer and writer, covering the SDGs area (mainly Sustainability / Wellness Lifestyle and Mental Health) for different platforms and publications in London and beyond. Because as consumers I believe we have the power to impact sustainable development and help eliminate unsustainable patterns of production and consumption. Being conscious about our purchases and lifestyle ethos is a step towards change happening, and it’s the little changes that make the long term differences. Supporting profressive companies shifts retail behaviour and gives reasoning to large scale businesses to make amend their manufacturing and sourcing behaviour. Best piece of advice you've been given that you would pass on to others? To spend time with people who motivate and inspire you. Be patient and follow your passions. Which G&S piece(s) you have your eye on this season? Please introduce yourself - what do you do? James in our marriage prep and when we follow this life is so much nicer! Why shopping ethically is important to you? are matter and deserve to be paid a fair wage for the work they do. What G&S piece(s) do you have your eyes on this season? Hello, I'm Lou Archell and I am the editor of a lifestyle blog called Littlegreenshed. I suppose I am what is commonly termed as an 'influencer', but I believe my role is much more than this. I write about travel and lifestyle on the blog, and on Instagram. Plus I am a stylist and photographer. I also am the founder of Sisterhood Camp, which provides offline retreats and an online community for women to connect. I live in Bristol, UK with my partner Dan and our two sons, Charlie & Rufus. Gosh, this is a hard one! I've been given many bits of advice over the yeas, not all good! but I think the best one is 'just focus on producing your best work, and forget about what others are doing'. I think this is true in all aspects of life. Just focusing on the best version of you, your work and life... and ignore the haters, the copycats and the competition - and most importantly ignore your own self-doubt! Shopping ethically can mean so many things. I believe by doing so we are supporting independent businesses, who often struggle against big brands and fast fashion. We are helping people in employment, as well as looking after the planet. What G&S piece(s) do you have your eye on this season? I love the Building Block Wall Crew, it has great colours. I also adore Veja trainers - I wear mine nearly every day! Hi, I'm Besma. I’m a freelance copywriter, small business owner, and I write the ethical lifestyle blog Curiously Conscious. I think it’s important to support businesses who are doing what you would do in their position. I want to make sure the people who made my clothes were paid fairly, and were happy creating the beautiful pieces I get to wear. Find joy in ethical fashion. An eco-luxury magazine founder once told me how hard he had worked to start his business and campaign for change, and after a number of years he realised that people want to hear about positive changes, good things with their clothes - not just pointing the finger at bad practices and big brands. It completely changed the way I write, shop, and live. On my wishlist is a pair of white Veja Esplar sneakers, the Rakha Wholly Sweatshirt and matching Wood Blewit Skirt. 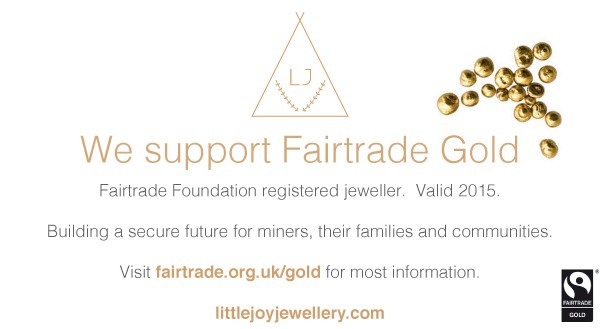 Hello , my name is Lauren , I am A Fairtrade certified and fully qualified goldsmith. I learnt my craft in Birmingham’s renowned Jewellery Quarter before launching the habour-side studio in Bembridge on the Isle of Wight. I am passionate about my craft and use all sustainable materials. I make minimalist, fairtrade pieces with a raw, contemporary aesthetic.Combining stripped-back design with age-old methods of jewellery making to create modern pieces with timeless appeal. Little Joy was founded upon the principles of minimalism, mindfulness and the art of slow-living. As such, I am commited to responsibly sourcing every element in the Little Joy business, from Fairtrade precious metals and GIA certified diamonds, to recycled packaging and my wooden ring boxes, that are made from the offcuts from renowned furniture makers Byron & Gomez. Each piece of Little Joy Jewellery is designed & made mindfully. I Ship my Creations Worldwide And Offer a Full-Bespoke Service. During my studies I learnt a lot about the industry’s history I was entering . I was certain from the start of my studies I wanted to ensure in doing my best to create a ethically mindful practice . I am learning more with each new technique or material source into how to develop my practice responsibly . Best advice I have been given is to “ have courage in your conviction “ by Jivan Astfalk at The School Of Jewellery , UK . I currently have an obsession with the Gold Vejas and the cosy Vildnis Disko Bay Jacket , feeling festive!